When manure is anaerobically digested, the biogas produced is primarily composed of methane and carbon dioxide, with lesser amounts of hydrogen sulfide, ammonia, and other gases. Each of these gases has safety issues. Overall, biogas risks include explosion, asphyxiation, disease, and hydrogen sulfide poisoning. Image: US Municipal Supply Company. Extreme caution is necessary when working with biogas. Adequate ventilation, appropriate precautions, good work practices, engineering controls, and adequate personal protective equipment will minimize the dangers associated with biogas. Wherever possible, digester-associated tasks and maintenance should be performed without anyone having to enter confined spaces, including pits. Systems should be initially designed so that confined space entry is not required to perform maintenance. The information presented here is for reference purposes only. No liability is implied. Methane, approximately 60% of biogas, forms explosive mixtures in air. If biogas is diluted between 10% and 30% with air, there is an explosion hazard. In 2003, several explosions on Canadian swine farms were thought to have been caused by the methane in biogas exploding (Choinière, 2004). Hydrogen sulfide and ammonia are also potentially explosive. Because of the explosion hazards, no open flames should ever be used near a digester. Also, equipment such as large engines and electric generators must be suitable to the environment so a spark will not ignite the gas. Explosion-proof equipment and electrical service, as well as non-sparking tools, should be used around digesters and biogas. There must be no smoking near the digester or related biogas lines and equipment. Asphyxiation from biogas is a concern in an enclosed space where manure is stored. 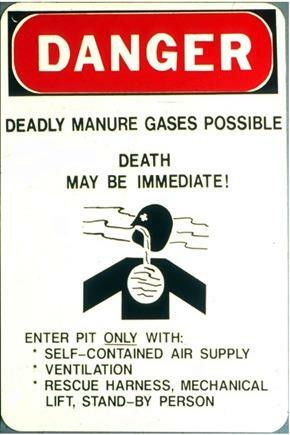 Osbern and Crapo (1981) report one case of three people who died from asphyxiation created by swine manure gas in an enclosed space. Even open-topped manure pits can generate methane at a sufficient rate to push out the air above the manure and render the space oxygen-deficient. Never enter a facility where manure is stored or where there is a suspected biogas leak as natural ventilation cannot be trusted to dilute the explosion hazard sufficiently. Airing out a facility does not impart safety, as some of the gases produced are heavier than air. If a person is found unconscious in such a facility, do not enter the facility because you may be overcome as well. Contact emergency services so that firefighters wearing self-contained breathing apparatus (SCBA) can safely retrieve the victim. Animal manure contains bacteria, viruses and, possibly, parasites. Biogas is generated by the anaerobic digestion of manure, which occurs because of the bacteria present in animal wastes, some of which can produce infection. When handling waste material, exercise appropriate precautions by using personal protective equipment to avoid contact with manure. Washing after working around the digester is recommended. It is particularly recommended to wash hands before eating and drinking and before touching the eyes or other mucous membranes. Keeping the digester facility clean will reduce disease hazards as well as the spread of odors and fly populations in the digester facility. Biogas consists mainly of 60% methane and 40% carbon dioxide, with low levels of hydrogen sulfide and other gases. Each of these gases can displace oxygen. Methane is lighter than air and will collect toward the upper spaces of the building. It is explosive at 5% to 15% concentrations. While methane is not a toxic gas, it displaces air so that, in a confined space, it creates an oxygen-deficient atmosphere. This is how it kills. Carbon dioxide is an odorless gas that is heavier than air. In a quiescent space, carbon dioxide can layer near the floor. Slightly elevated levels of carbon dioxide increase heart rate and respiration rate. Higher levels displace oxygen supply in the bloodstream, which can cause unconsciousness and death. Hydrogen sulfide is a highly toxic gas that is heavier than air. At very low levels, it smells like rotten eggs and can produce eye irritation. At dangerous levels, it destroys the sense of smell and produces respiratory paralysis. Thus, at dangerous and fatal levels, where one can literally drop dead, there is no odor to warn of its presence. The following table shows the health effects of hydrogen sulfide at different concentrations. Ammonia is a gas that is lighter than air, has a pungent odor, and can irritate the eyes and respiratory tract. Ammonia can displace oxygen in the bloodstream. Failure to heed manufacturer warnings may result in death or serious injury. Contact the manufacturer for maintenance and service requirements and availability of service. A safety walk-through can help you determine potential hazards and preventative measures. Cornell University developed a comprehensive self-assessment guideline for farmers. It is intended to be used by farm owners and managers or farm staff who are responsible for the operations and/or maintenance of anaerobic digesters and their related processes. It provides guidance for process and job evaluation with suggestions based on typical potential hazards for farm digester systems and their associated preventative measures. Explosion, suffocation, and poisonous gas hazards may be detected using gas sensors. These sensors include both disposable and electronic sensors. Electronic sensors need testing regularly, and these sensors may have a disposable component that needs periodic replacement. Only qualified people should use these sensors to determine if an area is safe. An area where manure is stored should never be entered without the appropriate personal protective equipment, which may include a self-contained breathing apparatus (SCBA). The use of protective equipment such as an SCBA is covered by OSHA regulations, and the operator must be certified in its use with equipment-fit testing and medical clearance. Self-Assessment Guideline for Farmers; Conducting a Safety Walk-Through on a Farm: Hazards of the Manure Handling System, Anaerobic Digester, and Biogas Handling System. Pennsylvania State University: Biogas Safety. This site also has biogas and anaerobic digestion information and links. Pennsylvania State University Manure Pit Safety. This site has educational videos that demonstrate manure storage hazards, the importance of monitoring manure gas levels before entry, and recommendations for the design and installation of ventilation of manure storages, emphasizing the importance of a positive pressure system for forcing fresh air into the storage. The site also has fact sheets that address manure storage hazards, monitoring for gases and oxygen, ventilating manure gases, and emergency rescue procedures. Information for accessing ANSI/ASABE S607, Ventilating Manure Storages to Reduce Entry Risk, and ASABE EP 470, Manure Storage Safety, are provided. Respiratory Protection, Personal Protective Equipment. OSHA Regulation 1910.134 that applies to some anaerobic digester facilities; all operators should refer to these standards in an advisory capacity. Manure Pit Gas Hazards. National Safety Council. Manure Gas Can Be Deadly; and When OSHA Comes Calling: Are You Prepared for an Occupational Safety and Health Administration Inspection? Cornell University Manure Management Program and NYSERDA. Articles were published in Northeast Dairy Business magazine, August 2005. Manure Gas Is Dangerous. Farm poster from Cornell University and NYSERDA. Ventilation Standard Development for Confined-Space Manure Pits. Poster from NORA Symposium, 2008. Brown, N.J. 2007. Conducting a safety walk-through on a farm: hazards of the manure handling system, anaerobic digester, and biogas handling system – a self-assessment guideline for farmers. Manure Management Program. Cornell Dept. of Biological and Environmental Engineering. Ithaca, NY. Martin, J.H. 2008. A New Method to Evaluate Hydrogen Sulfide Removal from Biogas. M.S. Thesis. Raleigh, N.C.: North Carolina State University, Department of Biological and Agricultural Engineering. Osbern, L.N., and R.O. Crapo. 1981. Dung lung: a report of toxic exposure to liquid manure. Ann. Intern. Med. 95(3):312-4. Choinière, Y. 2004. Explosion of a deep pit finishing pig barn, investigation report on biogas production. In Proc. ASAE/CSAE Meeting. Ottawa, Ontario, Canada. Wright, Peter. 2001. Overview of Anaerobic Digestion Systems for Dairy Farms. Natural Resource, Agriculture and Engineering Service:NRAES-143. Ithaca, NY. James Carrabba, Agricultural Safety Specialist, New York Center for Agricultural Medicine and Health (NYCAMH).